WASHINGTON, DC, U.S.A., September 23, 2013: A technology for producing three-dimensional prototypes, mold components, and even finished parts direct from digital files will be the focus of a new annual exhibition called NPE3D: The Manufacturing Industry’s Global 3D Conference and Solutions Fair, it was announced today by SPI: The Plastics Industry Trade Association. The first NPE3D will be held in conjunction with SPI’s NPE2015: The International Plastics Showcase and will be open to both badge holders and the general public. NPE2015 will take place March 23-27, 2015 in Orlando, Florida. 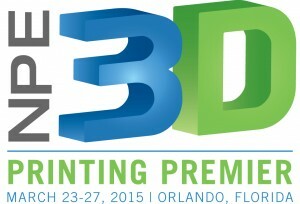 Thereafter, for years when the triennial NPE is not held, SPI will announce a location and schedule for NPE3D. NPE3D will present exhibits and educational demonstrations of 3D printing, a technology that recent advances are rapidly making more accessible to designers, toolmakers, and processors in sectors as diverse as automotive, consumer products, medical devices, and packaging, according to Gene Sanders, SPI’s senior vice president of trade shows and conferences. During NPE2015, NPE3D will take place in a nearby common area with public access to all. More information about NPE3D is available at www.NPE3D.com.